We're planning our tailgating parties and backyard barbecues and you know what comes first: food! We love a good grilling recipe. Tailgating recipes need to be easy to make on the go, have a few easy to find ingredients, and most of all, have to taste GREAT! 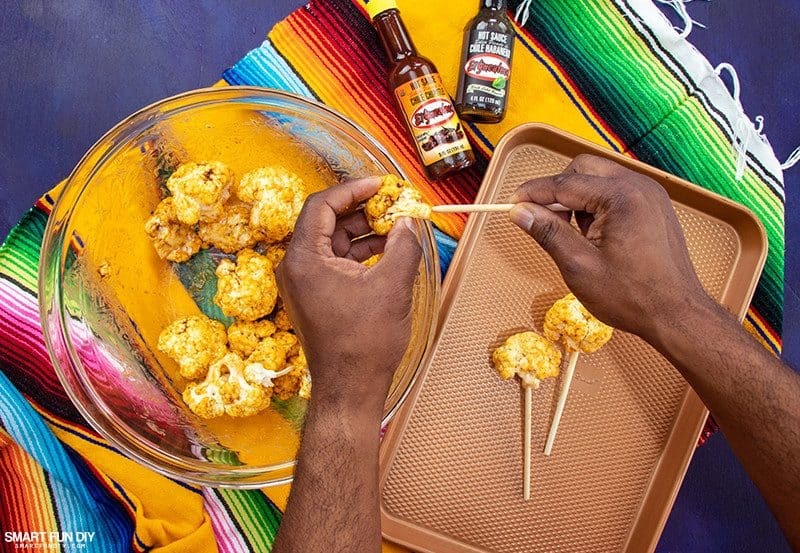 So when my husband Xaver pulled these spicy roasted cauliflower “lollipops” off the grill, I couldn't keep my hands off them. I knew we had a winner with this veg lollipop recipe when I had to tell my 11 year old son to stop eating them! 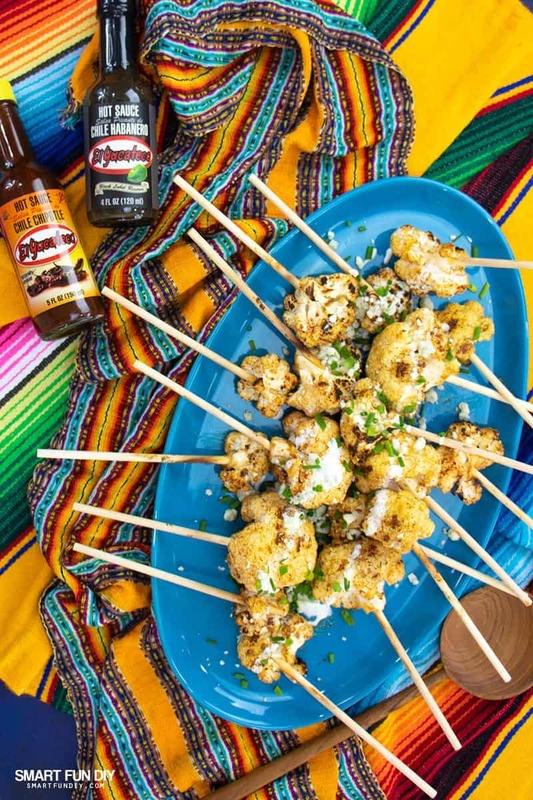 This spicy cauliflower lollipop recipe gets it kick from El Yucateco hot sauce and uses only 5 ingredients! Are you ready for this yumminess?! 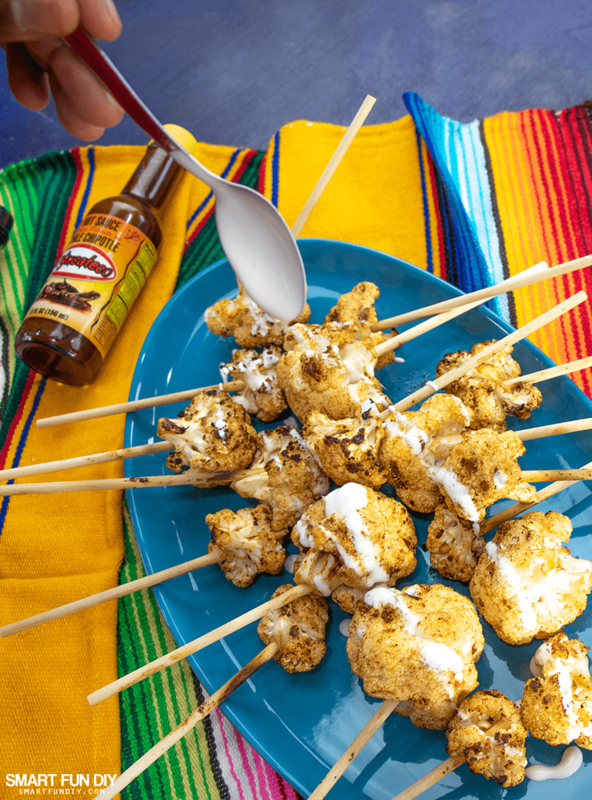 This recipe was inspired by the trend of buffalo cauliflower and chicken lollipops I've been seeing in California restaurants this year. We combined these dishes together, using our latest hot sauce obsession, El Yucateco Hot Sauce Chile Chipotle, in place of buffalo sauce. El Yucateco Hot Sauce Chile Chipotle adds a smoky, chile flavor with a heat that is more of an experience. With El Yucateco you get more of the flavor with a little bit of kick. We use El Yucateco on our eggs too. And even the kids love it! Do you have anyone in your tailgating crew with dietary restrictions? 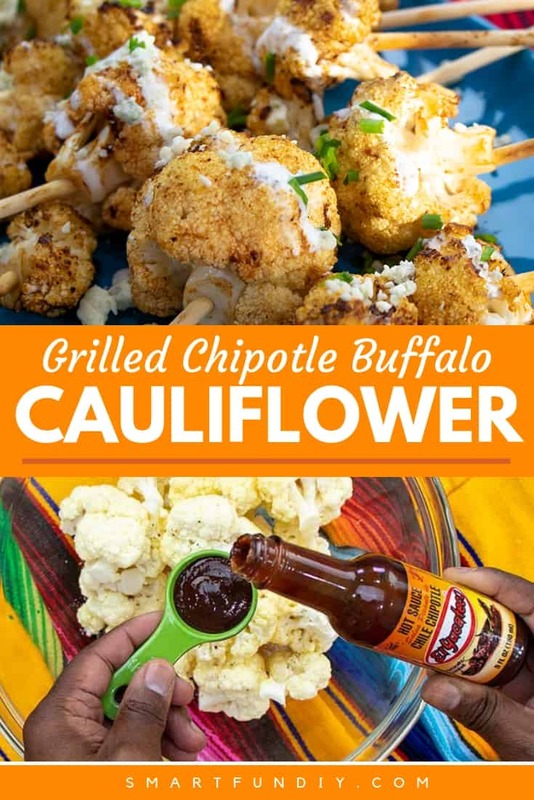 I love buffalo cauliflower but most of the time it features breaded and deep fried cauliflower. Since I follow a paleo or keto diet, all that breading is a no-go. If you have guests who are gluten-free, then you know the struggle in finding foods that taste good but that everyone at you party, including your GF friends, can enjoy. 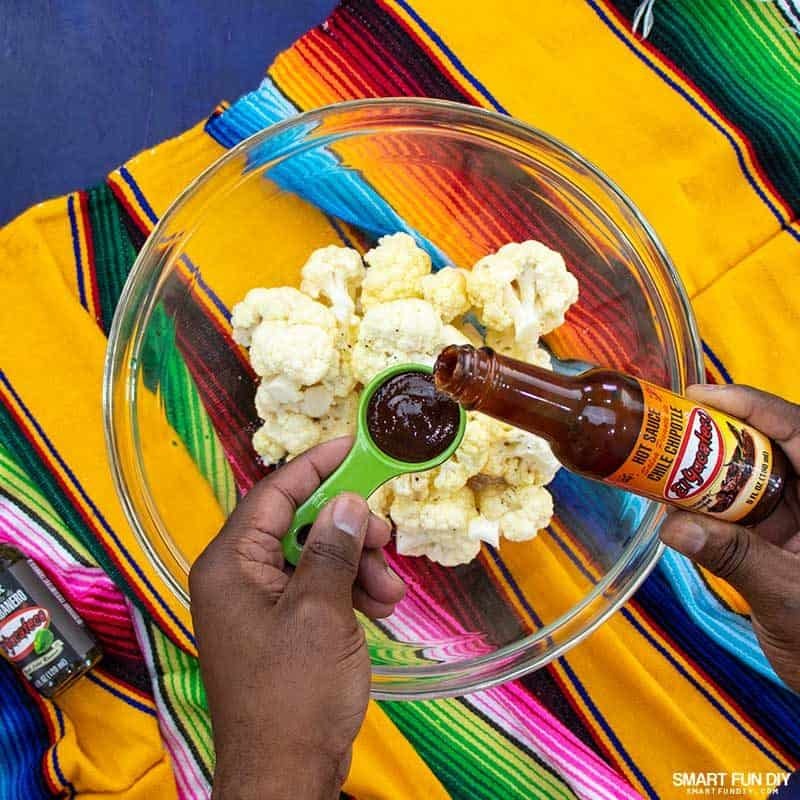 Since we wanted a dish the kids would love but had a kick for the adults, I decided to use El Yucateco Hot Sauce Chile Chipotle for this spicy cauliflower recipe. For more of a kick, you can also use the El Yucateco Hot Sauce Chile Habanero Black Label Reserve sauce in this recipe. 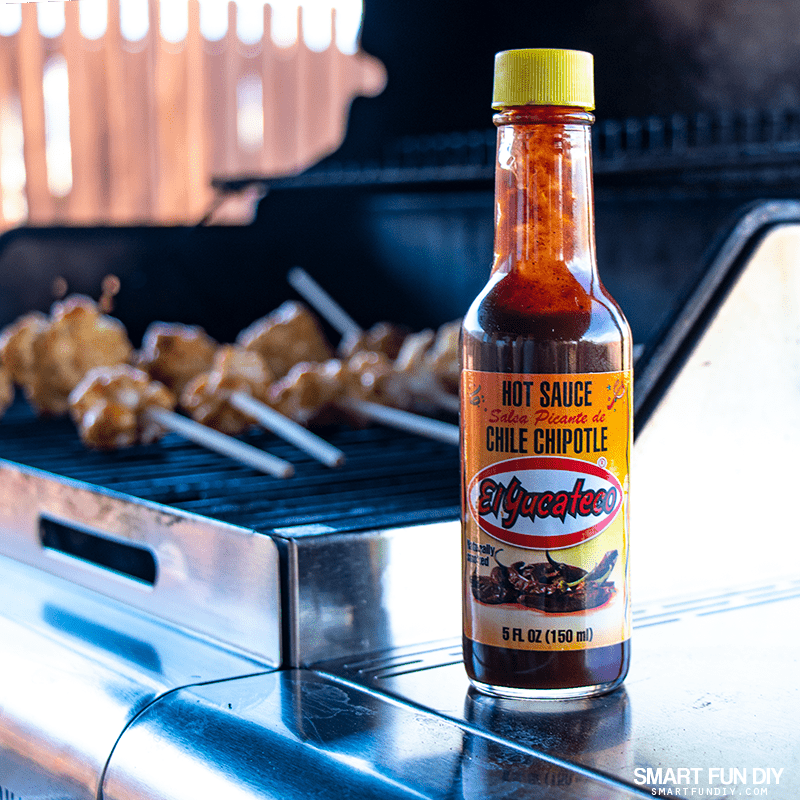 A recipe designed for tailgating – you can make it on the grill! 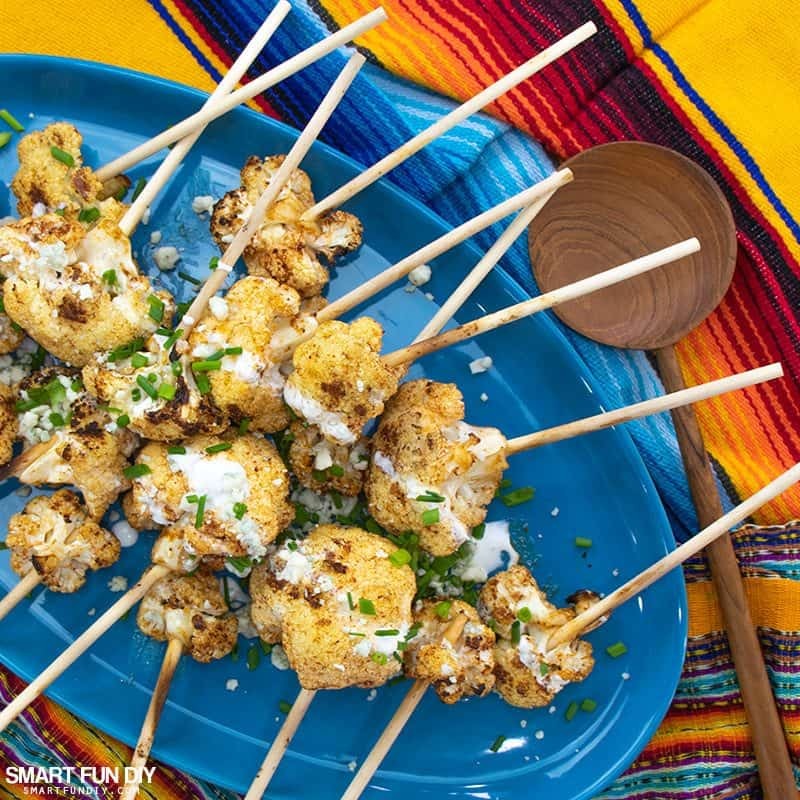 We designed this spicy cauliflower recipe to be a perfect-fit for tailgating, camping, or backyard barbecuing. The only cooking device you need is a hot grill! You'll see later in this post that the recipe has melted butter – you can melt this in a pot on the grill. We also wanted the recipe to be easy to eat – that's why we added the cauliflower florets to wood lollipop sticks. 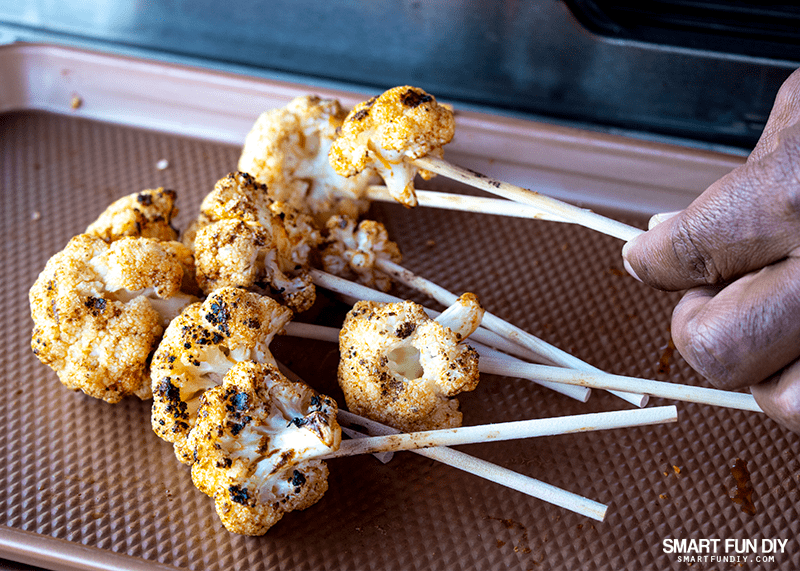 The sticks make the cauliflower lollipops easy to turn on the grill and easy to eat when they're served! 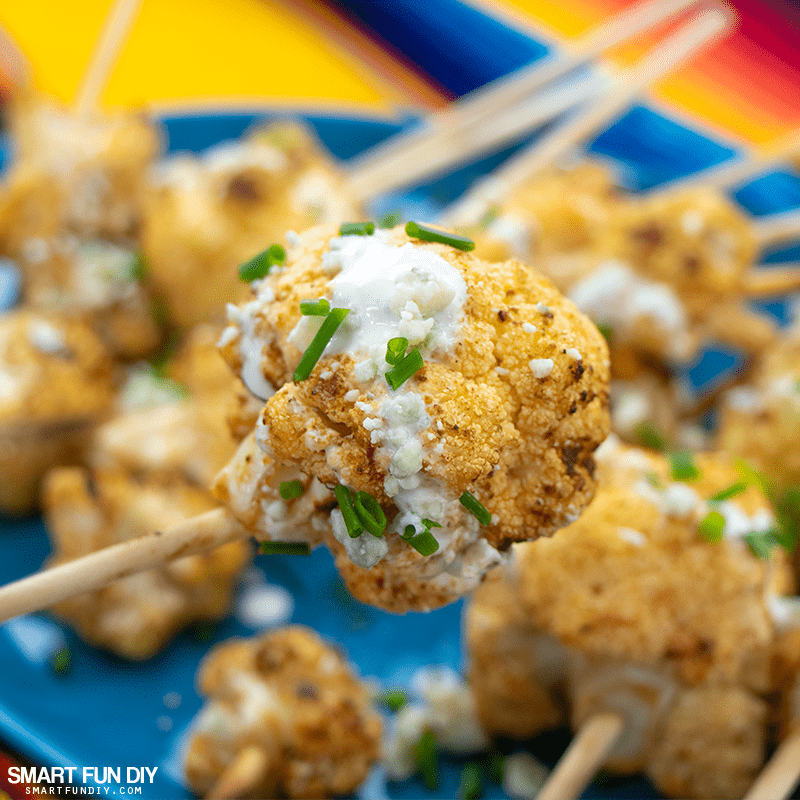 Lay the spicy cauliflower lollipops on a platter and serve drizzled with fresh crema, blue cheese crumbles, and diced chives. Can they eat it with out utensils? 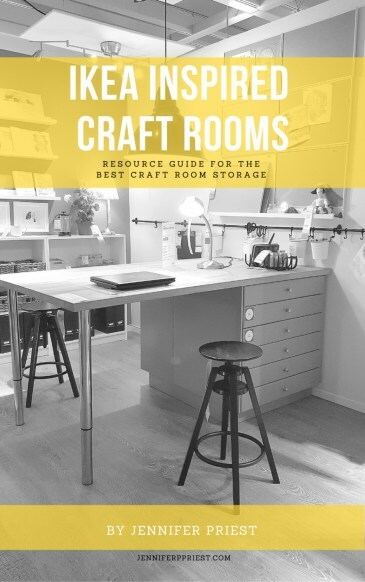 This saves money and it's less you have to bring! And above all, just have fun with it! 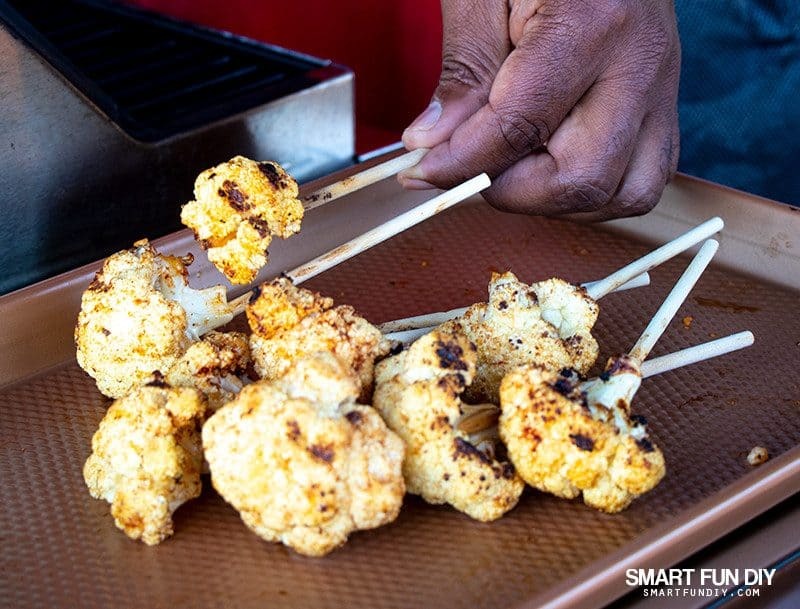 Are you ready to make this spicy cauliflower recipe and knock the socks of your tailgating fam?! 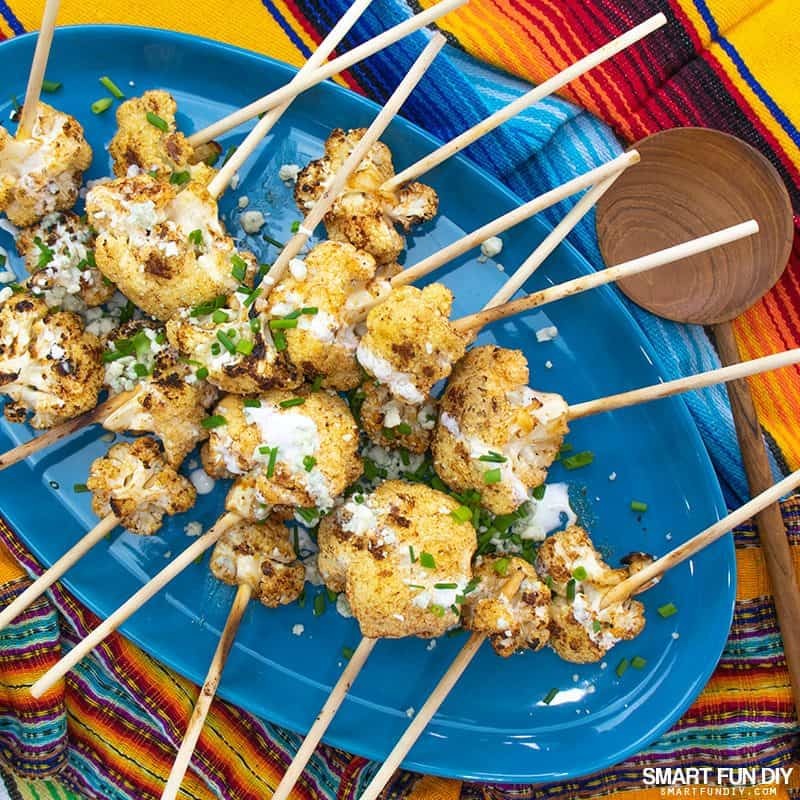 The first step is to make this simple cauliflower recipe is to soak the wood lollipop sticks. You can use bamboo skewers if you don't have lollipop sticks. 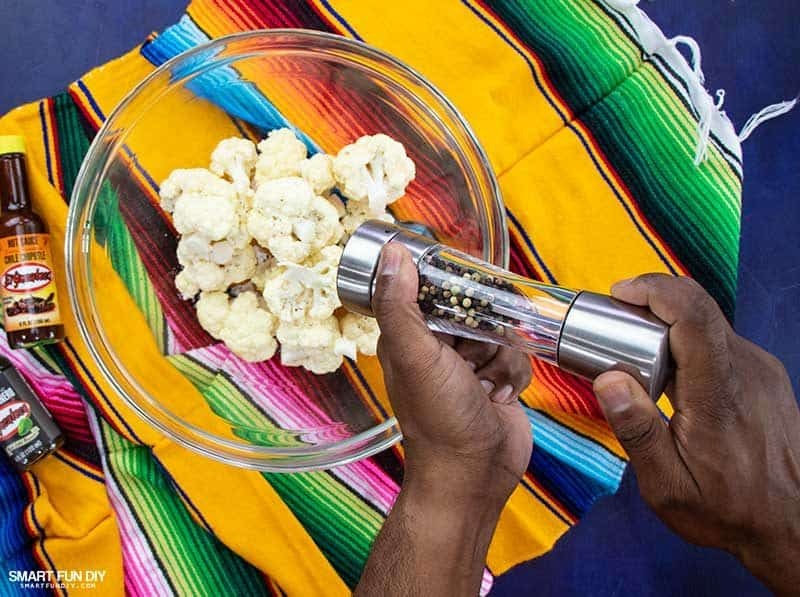 This will make them easier to insert into the cauliflower but also prevents the wood from burning while you grill the cauliflower. 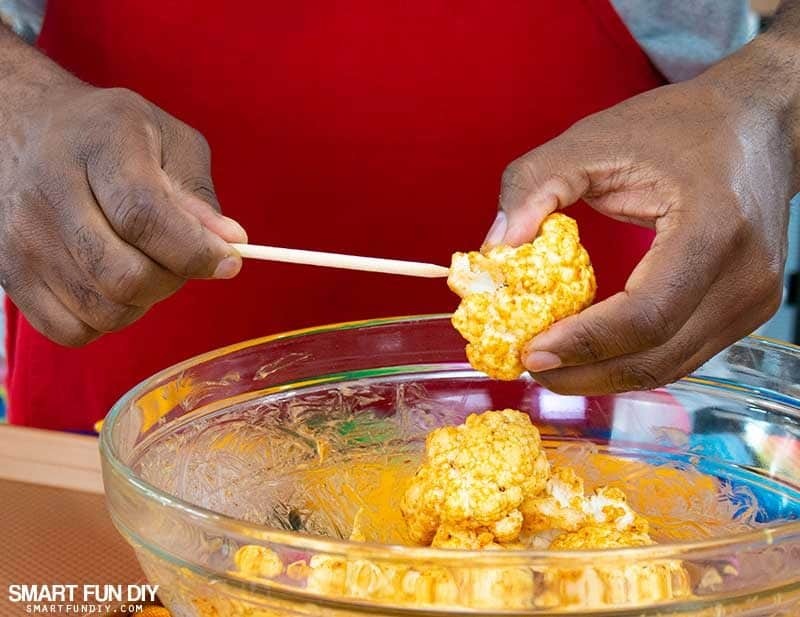 While those lollipop sticks are soaking, cut the head of cauliflower into florets. You can use pre-cut cauliflower but I find that working with the whole head of cauliflower is best because the florets are crisper and go onto the wood skewers more easily. We chose an organic head of cauliflower. 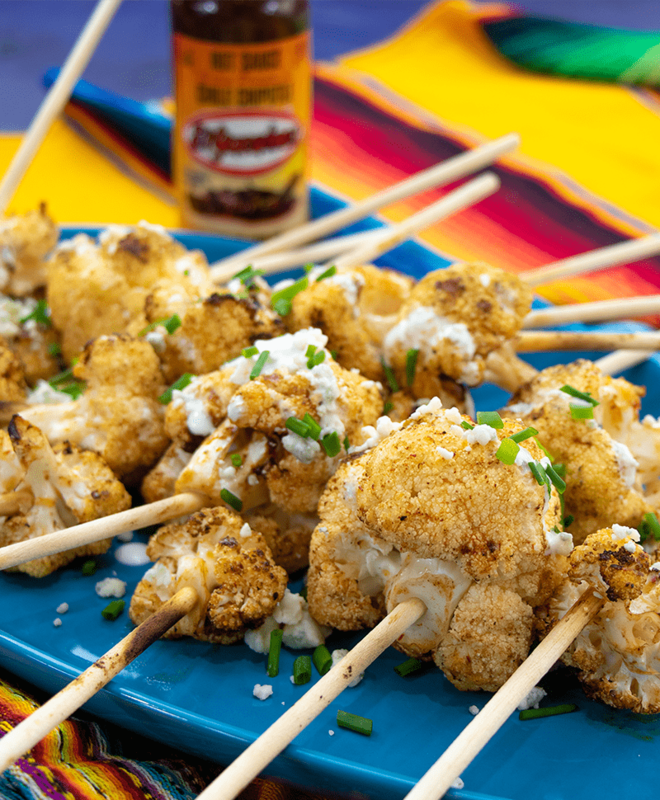 You can also make this recipe with colorful cauliflower varieties as well. Split the florets apart, in about 2″ wide pieces. You can do this step at home. Place the cauliflower into a colander and rinse well. Allow any excess water to drain. Melt the butter in the microwave (if at home) or in a small pot on the grill. Toss the cauliflower with the butter. Then add El Yucateco Hot Sauce Chile Chipotle. Toss to coat. Insert the wood lollipop sticks or bamboo skewers in to the bottom of each floret. Place the florets on the grill directly over the flame, with the sticks away from the flame. Grill on each side for about 5-10 minutes, depending on how “done” you like the cauliflower. 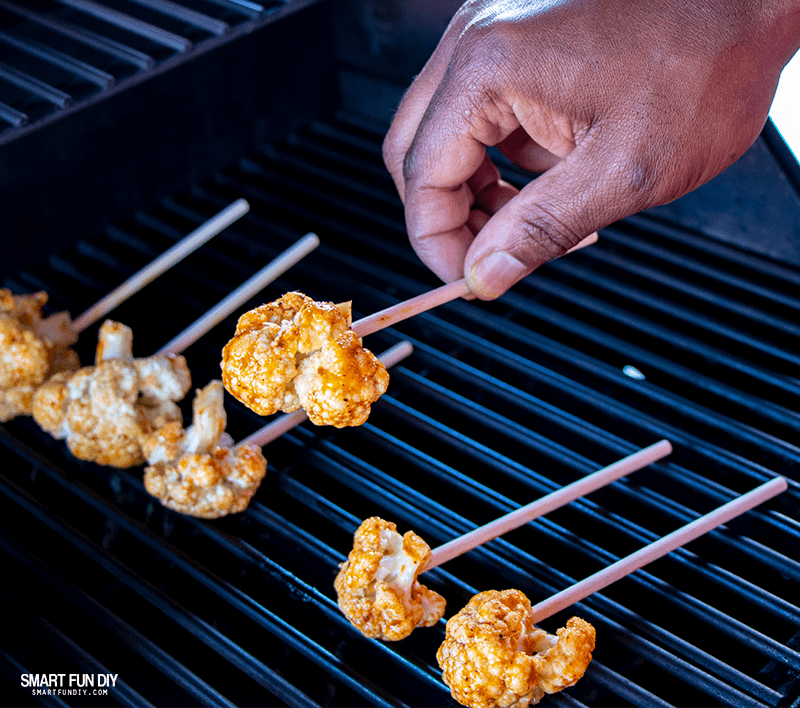 Remove the cauliflower lollipops from the grill when they reach the doneness you like. Arrange the cauliflower on a platter. Drizzle with 1-2 Tablespoons of crema Mexicana. Sprinkle on the blue cheese and chives. Serve. If you are making these at home, you can cook the cauliflower in your oven. 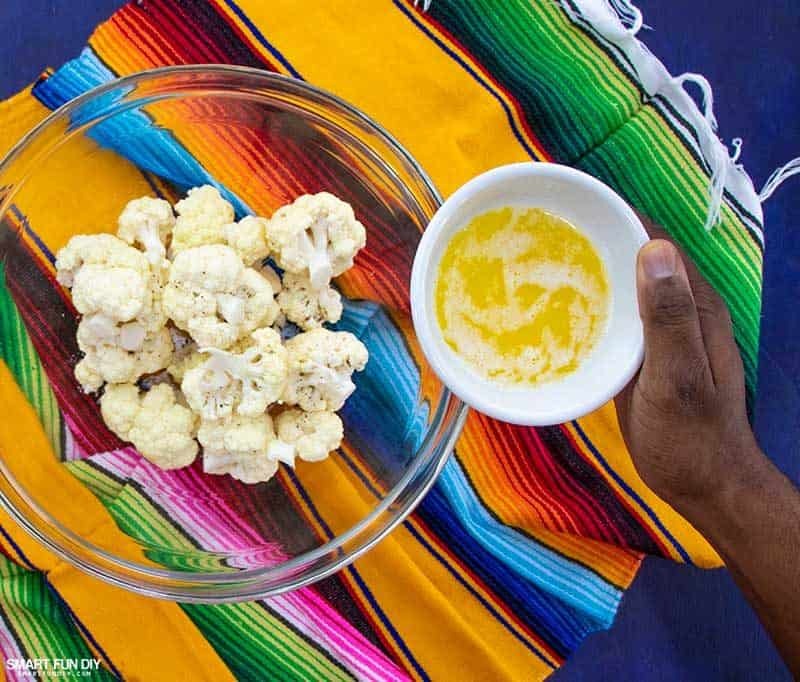 Want the printable Spicy Cauliflower recipe? Here ya go! 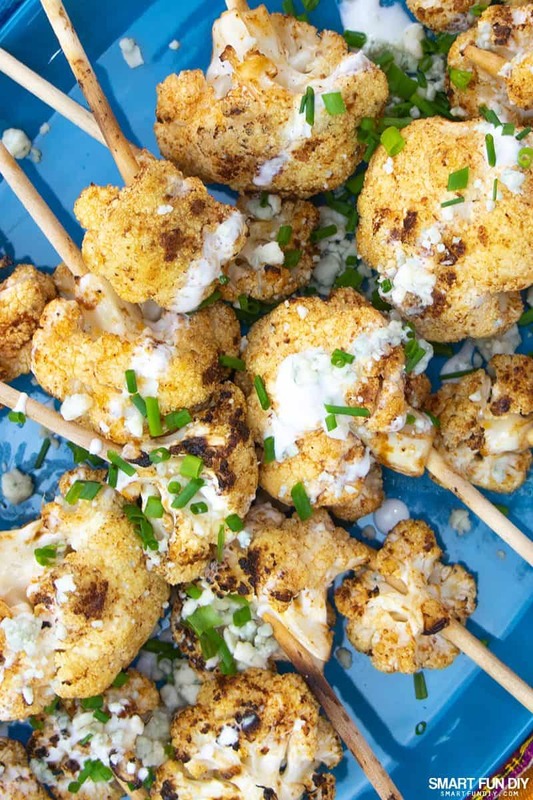 A delicious gluten-free simple cauliflower recipe the entire family will love. 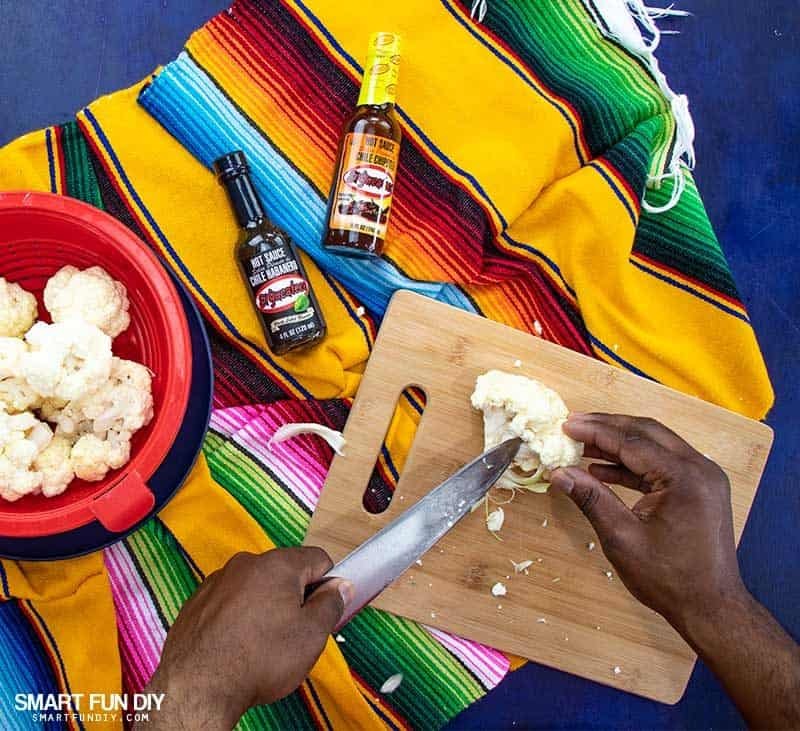 This tangy, spicy 5 ingredient cauliflower is a hit at parties, tailgating, and even as a side dish for dinner. BONUS: kids love it! Soak the wood lollipop sticks in water. Cut the head of cauliflower into florets. Split the florets apart, in about 2″ wide pieces. Place the cauliflower into a colander and rinse well. Allow any excess water to drain. Add 1 TBSP of El Yucateco Hot Sauce Chile Chipotle. Toss to coat. Place the florets on a hot grill directly over the flame, with the sticks away from the flame. 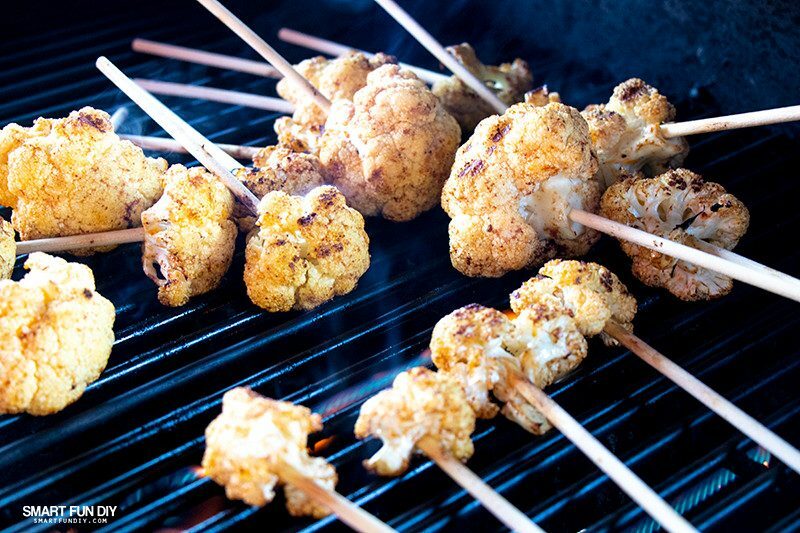 Remove the cauliflower lollipops from the grill. Arrange the cauliflower on a platter. Drizzle with 1-2 Tablespoons of crema Mexicana. Sprinkle on the blue cheese and chives. Serve. What games are you planning to go tailgating for? Let me know in the comments!! How to make a pinata with cardboard … with a Fruity Pebbles cereal box! These look awesome! I’d love to give them a try. Yum! These look devine! I love the roasted cauliflower trend. Especially when it has a kick to it. What a great way to get your kids to eat their veggies! Thank you for sharing at Party In Your PJs!